slow process but it can be irreversible. Sikhs males have religious reasons not to cut their hairs throughout the life. The long hairs are kept hidden under their turban after winding them in a ‘Rishi knot’. It is an irony that this long hairs due to constant traction on the root due to this knot result in premature hair loss over the years. This especially happens in the frontal and temple area where the traction stress is maximum. 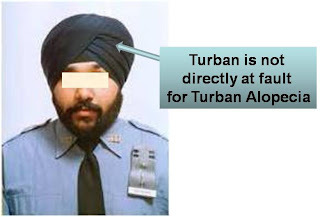 This is common to all those Sikhs round the world may be in millions. 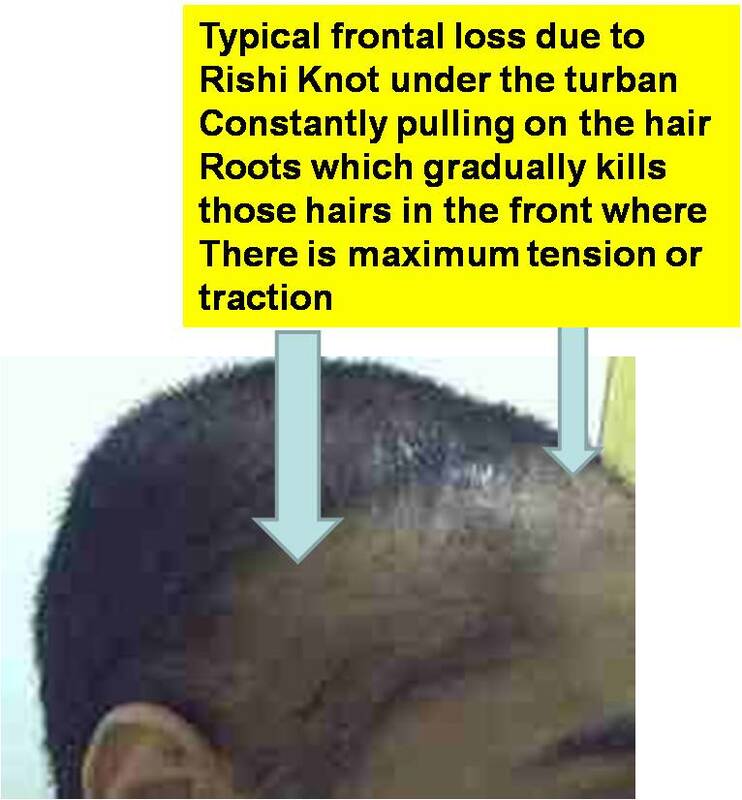 It's a subject rarely discussed because it's relatively easily hidden, but hair loss is a big problem among Sikh men and covering it up doesn't take away the associated distress. Traction alopecia can be exacerbated by the ritual combing of the hair. This can be alleviated by straightening out the hair and working through tangles with the fingers before combing, thereby reducing the pull of the comb. It's important to keep the hair soft and in good condition even if you're not worried about other people seeing it. ‘Rishi’ knot less tightly. 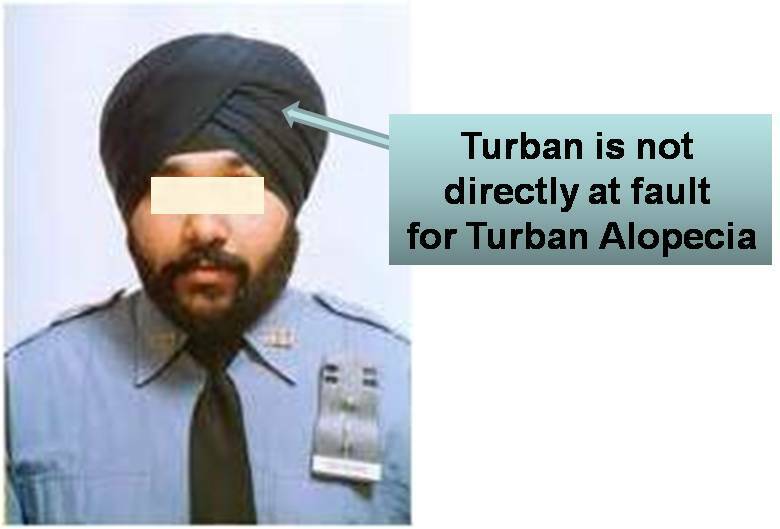 The problem is not with wearing the turban, but with improper hair care. Hair must be combed down at night and then joora retied in the morning. Keeping joora tied all the time does not allow hairs to relax properly. Use a light fabric and only use as much fabric as is absolutely necessary to contain the hair. The weight of extra fabric will put added strain on your hair. 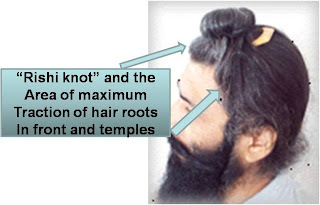 Be careful not to bind the turban too tightly - it's better to secure it with grips further back on the scalp if necessary, as hair is most vulnerable toward the front of the head. With Be careful to position your hair directly on top of your head before you bind it. This will enable your head to support most of the weight of your hair directly when you are upright. If you tend to lean backwards when sitting, be careful to keep your head upright. 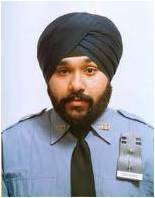 Some Sikhs who suffer from traction alopecia choose to give up on wearing turbans altogether and to keep their hair in pony tails instead. If you do this, make sure that you don't draw it back too tightly from your head and that you secure it loosely. It is interesting to note that traction alopecia often occurs as a result of various headwear and hair styles, including hair extensions, wearing tight ponytails and wearing tight fitting-hats. But if you take care to look after your hair and bind it appropriately, you are likely to be able to keep much of the length of it at the back for most of your life. 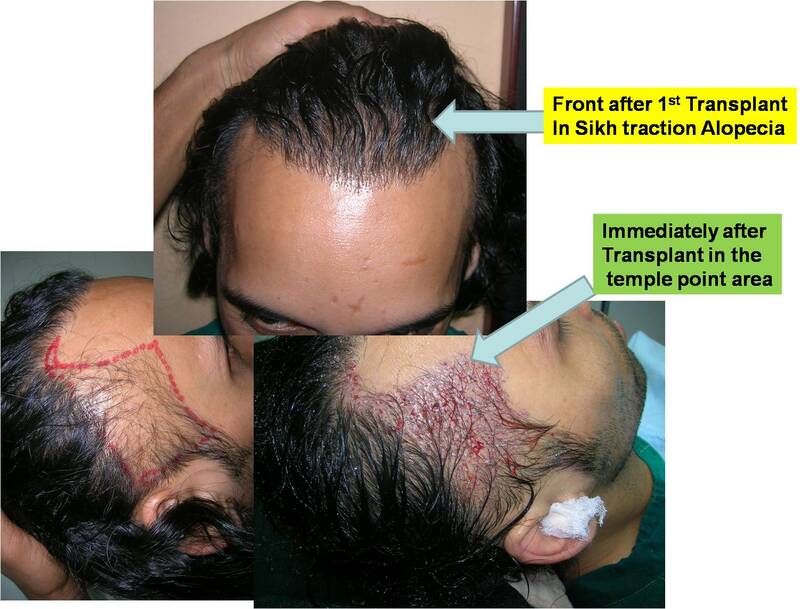 As a permanent solution to restore hair, hair Transplant is recommended as it is not possible to medically restore lost hair as shown in one of my patients. 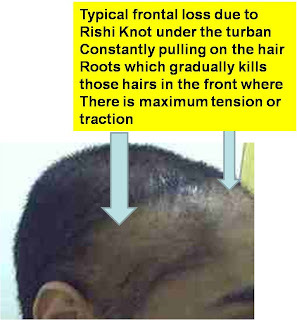 Although Sikh men are as susceptible to other forms of hair loss as anyone else, they commonly suffer from what is known as traction alopecia. This occurs when the knotting of long hair pulls on the hair over time so that its roots are damaged. 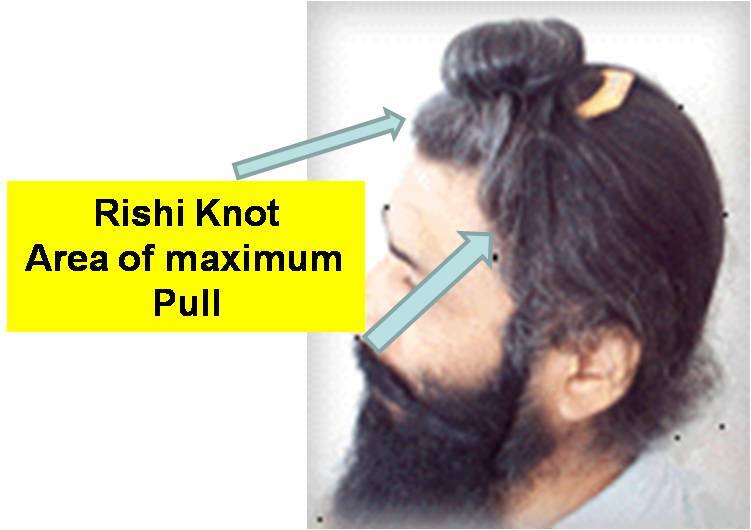 It is different from pulling hair out accidentally when taking the turban on or off. It is a slow process but it can be irreversible. "This site is intended to educate the public on hair loss topics based on personal experience and opinions of Dr. Bishan Mahadevia . Information provided on www.goodbyehairloss.com. blogspot.com should not be used for the purpose of Medical diagnosis or Treatment."